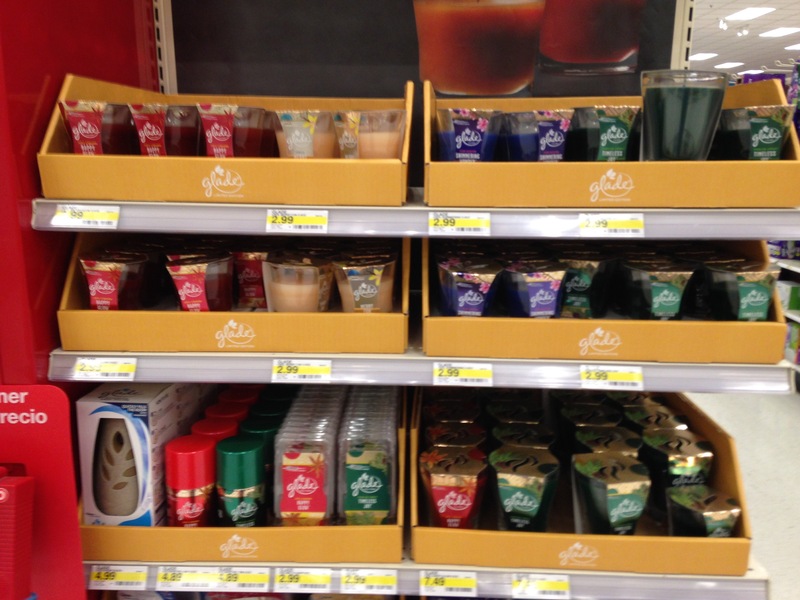 Elsewhere in the store, the Glade winter scents are already on display. My least favorite part of this is that it usually means that the Autumn scents are either gone or will be soon. The good thing is that if you can find them they will often have clearance prices. They are sold out in many stores. The Autumn package art was beautiful and I thought the scents were really nice (unless you don’t like pumpkin, etc.). For somebody who usually prefers natural essential oils, that’s saying something. So I didn’t buy any winter scents yet because I refuse to by them in October. I like to enjoy my Autumn in Autumn. (And I still have some of the holiday spruce scent left from last year. Dave doesn’t really like it). Happy Glow — an apple & cinnamon scent. It smells similar to autumn’s Spiced Apple Magic (apple, cloves, cinnamon). If anything it’s a maybe little more cinnamony, but I’m not sure if it’s even different. In past years, the holiday apple scent had a lot more cinnamon & spice than the autumn version, but I don’t smell as much difference this year. The candle color is a slightly lighter shade of red — a little more of a Christmas red. Comparing the color of the wax melts they look almost the same. Overall I like it. It’s a good homey scent. Timeless Joy — a sparkling spruce scent. This is a traditional Christmas tree type scent. Smelling this type of scent always reminds me of Christmas. It’s not so much that it smells like an actual tree, but because similar tree-inspired scents have been in candles and sprays for Christmas holidays for so long. It automatically stirs up holiday memories. Merry Fun — a vanilla scent. It’s a soft, pleasant vanilla. Shimmering Wonder — a plum blossom scent. I’d not have pegged this as a winter scent, but here it is. It’s a little fruity and floral. There’s a hint of candy (almost like Pez candy), berries, vanilla, and maybe violets too. If the Wondrous Autumn Nights fragrance was masculine, then this one is more feminine. I’m trying to think of it as sugar plum to tie it to the holiday spirit. A bit of spice may have been nice to make it like a plum pudding or holiday sugar plum. But not everybody likes spice. There may be a hint of anise here and vanilla, but that’s about it. I can’t think of any previous year’s fragrance that was quite like this. The Pommegranite Sparker from last year was maybe similar, but this one seems sweeter. They are definitely not the same. Not sure how I’ll like it in the home at this poin, but I smelled it a few more times and it’s kind of growing on me. So far, I saw all four scents as jar candles and plug-ins (Walmart and Target). 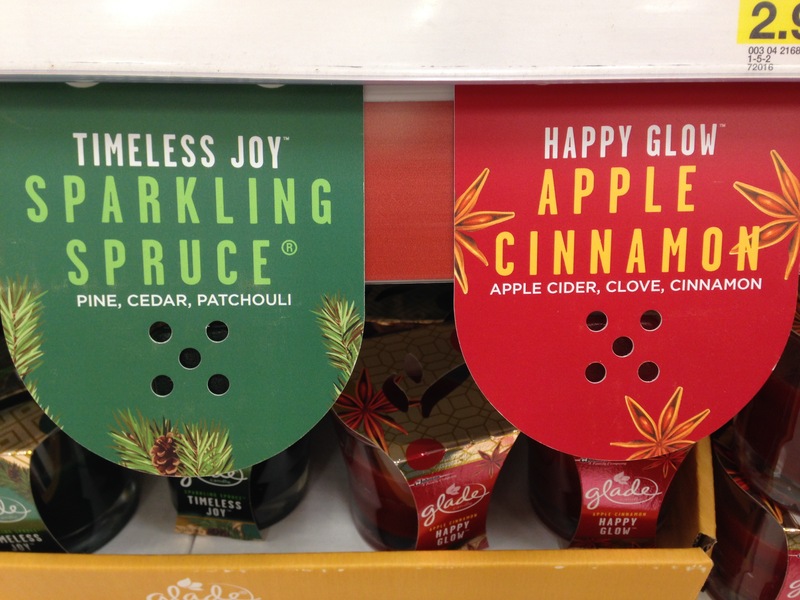 I saw Happy Glow (Apple) and Timeless Joy (Spruce) as wax melts, auto-spray refills, and solid air fresheners at Target. I didn’t see wax melts or room sprays at our Walmart, but it had auto-spray refills of apple and spruce. I didn’t see wax melts of Merry Fun (vanilla) or Shimmering Wonder (plum blossom) anywhere yet. I’m guessing maybe Dollar General will have one of those (which I would check if there was a Dollar General closer to my home). The Target had a $1 room spray in all except the vanilla scent. But I saw the vanilla room spray at a larger Giant grocery store (which, instead, doesn’t have the plum blossom room spray). I’m guessing there will be another exclusive somewhere, maybe? So there you have it. These aren’t even listed on the Glade website yet, but you can expect them soon. And yes, I’m the crazy lady taking pictures of air fresheners in the store. But no, I’m still not buying Christmas scents in October. 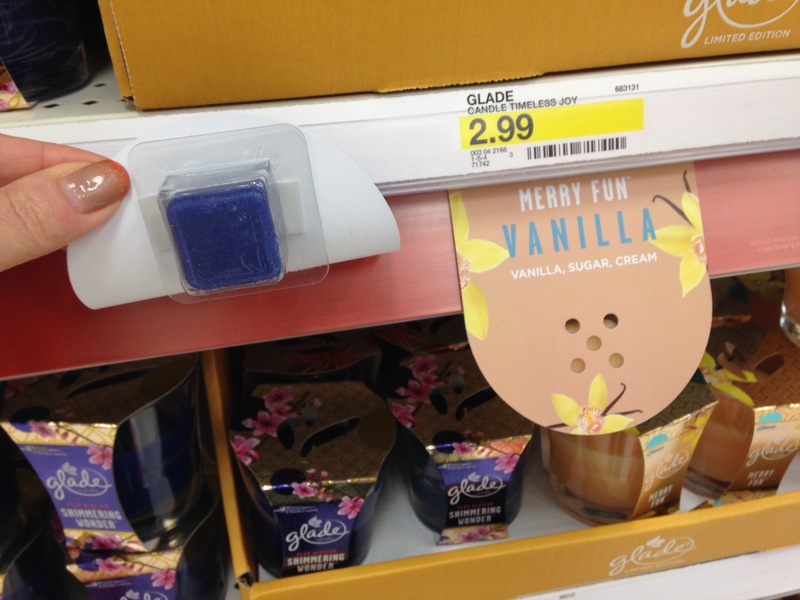 My Target added a scent sampler to the Galde seasonal display. It has a wax melt cube encased in perforated plastic and labeled with a description of the scent. None of our local stores had this previous years. I usually just smelled the candle or a package of wax melts or scratch & sniffed the sticker on the oil refills depending on what I could find. Sometimes the different versions have subtle differences. The wax melts usually have the strongest aroma. Of note, the Shimmering Wonder fragrance is described as Plum, Black Tea, and Praline. I guess I can see that. Tea can smell a little floral and woodsy. The praline fits somewhat with the candy notes I smelled. And the fruitiness is somewhat plum but maybe a little blueberry-ish too. So it appears that they do make a wax melt of both the Plum Blossom and Vanilla scents. They just don’t actually sell it at my Target (or Walmart as far as I can tell). And it is November now, so maybe I’ll try one of these soon. I’ve read a few complaints regarding the Glade scented oil refills dripping out and ruining the finish of furniture or floors. Please keep in mind, that there is liquid inside that can leak out once the product is opened. So the “bottle” must be kept upright once opened. I saw one person post photos along with a complaint and noticed that this individual had their Plug-in inserted into the wall outlet UPSIDE DOWN. Yes, it will leak then. As far as causing damage, even many 100% pure therapeutic-grade essential oils will eat the finish off wood and dissolve many types of plastic if it touches it for a while. That is common with any kind of concentrated fragrance — natural or lab-created. So be careful not to plug in a Plug-in upside down or sideways. It’s that time of year again — the days are getting shorter. The air is getting cooler. And Glade’s Autumn Collection is in stores! Gah, how can I like Glade so much? I used to … I won’t say “hate” but … not like Glade. 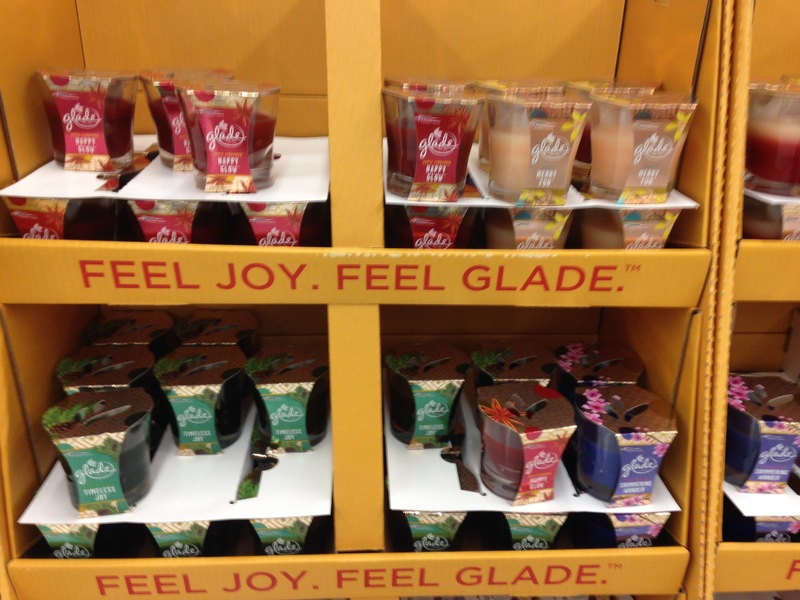 Now I feel a little spark of happy every time I start seeing Glade’s fall fragrances in the stores. Summer and spring fragrances don’t quite do that to me. (I usually just open a window.) Even the winter and holiday scents aren’t as magical to me as the autumn collection. And I still love pure essential oils. So how can I like Glade’s Aumun Collection so much? The 2016 Fall collection is scaled back from the five(!) fragrances of the past few years. There are three (maybe four*) that I’ve seen so far. Autumnal classics are covered with apple and pumpkin pie plus there’s a third enticing mood-setter for chilly days. Spiced Apple Magic – classic fall spiced apple fragrance with a nice balance of fruit and spice. It’s doesn’t smell as strongly of cinnamon as the Apple cinnamon fragrance that’s available year round. Along with cinnamon I can smell cloves, and I can really smell the apple. Spiced Apple Magic is that cup of hot spiced cider as you come in from the chill. Rich Pumpkin Dream – classic pumpkin pie scent with a little sweetness, creamy caramel, and spice. This one smells yummy. Last year’s Pumpkin Pit Stop smelled like pumpkin pie mixed with the lingering aromas of last night’s experimental dinner. I swear I could smell something like fenugreek seed and maybe a hint of cumin last year, but this year I smell something cardamom and ginger. I definitely prefer this year’s. *There also appears to be a fourth option at some locations called Rich Golden Spell. It’s available as a room spray and only available at Target as far as I can tell. It’s not even on the Glade website! Some folks say it’s just a repackaged version their popular scent Cashmere Woods (which started as a seasonal scent, so go figure). I have Cashmere Woods wax melts, and based on that I’d say they are, at least, very similar. But I love the packaging and design of the Autumn Collection, so it’s nice just for that. The sprays this year are a little diffferent. They’re mostly available as automatic-spray refills and not stand-alone cans. I don’t have an automatic room sprayer and don’t plan on buying one right now. The standalone spray is no longer sold as a Premium room spray, but instead sold in the smaller, standard Glade spray cans. That part is not necessarily bad. The regular sprays cost only about a buck ($1). (Premium room sprays were about $3.) But Spiced Apple Magic and Rich Golden Spell (if you can find it) are the only ones that I’ve seen as a room spray. I’d love a spray of Wondrous Autumn Nights and have enjoyed the pumpkin spray previous years. 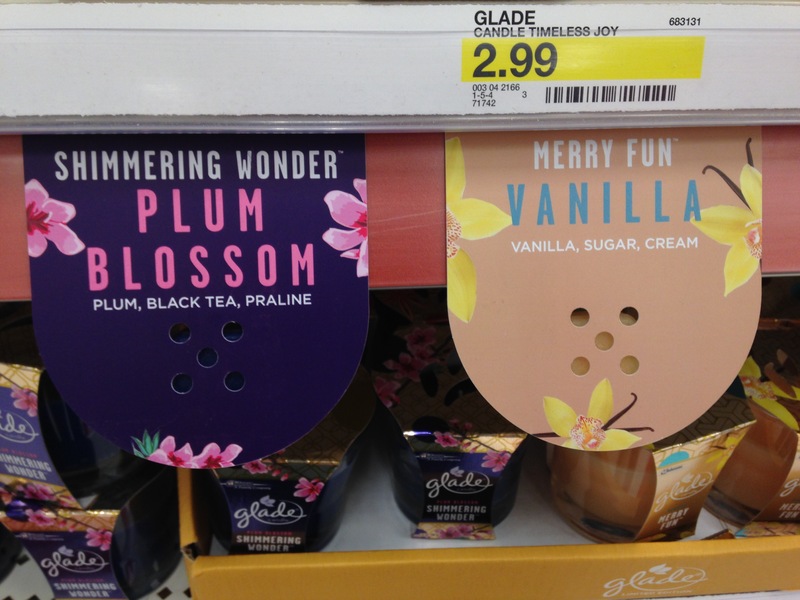 Glade has also changed some other ways the fragrances are sold this year. Two of the autumn scents are offered as a solid air freshener — Spiced Apple Magic and Rich Pumpkin Dream. I think this is the first year I’ve seen Glade’s Autumn scents in solid form. I don’t often use solid air fresheners except in the little bathroom with the cat litter boxes. I’ll try these next. All three scents are available as candles, plug-ins, and supposedly wax melts too. But I can find find wax melts of only Spiced Apple Magic and Rich Pumpkin Dream. Wondrous Autumn Nights is missing, so I suspect maybe there is only one store chain that may carry it as part of an exclusive agreement. It will probably sell out. I think I would love that as a wax melt. Oh, Glade. Why do you do this?